Organize your office space with Krylon® Sea Glass. Set up lazy Susan in a well ventilated area. Place glass jars on top of lazy Susan. Clean jars using glass cleaner and microfiber cloth. Wipe surface with antistatic wipe to remove all dirt and debris. 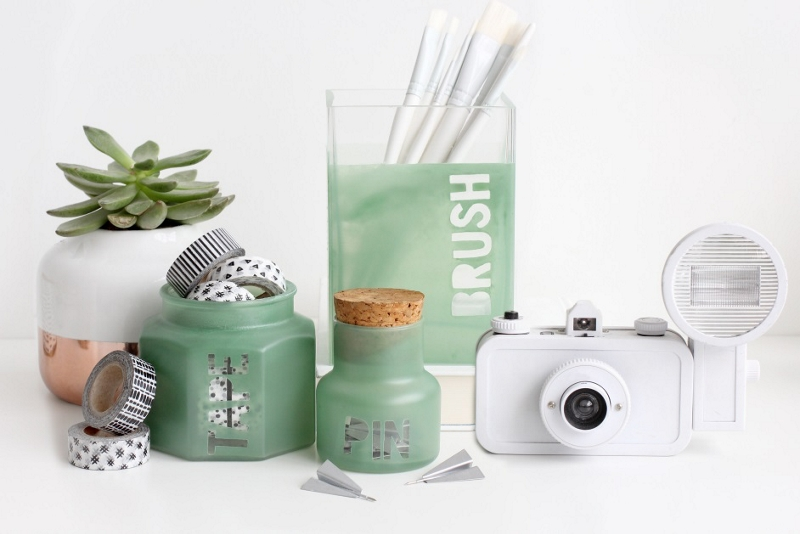 Place vinyl letter stickers onto glass jars. After reading product label for proper application and safety instructions, shake can for two minutes, and spray glass containers with three thin layer of Krylon® Sea Glass Finish in Sea Foam Green. Once paint has fully dried carefully pull off each vinyl letter.